There has been a lot of crazy stuff that has happened in America over the last 10-12 years. From terrorist attacks, to the .DOT com bubble to the near collapse of our entire financial system it surely has been one hell of a ride…and one I know most of us would like to get off of sooner than later. We were all looking for answers and wanted to find stability, something we could hold onto, something that was “American” and awesome. So we built. We built millions and millions of these things called homes and condos. Many of these homes where much larger than the homes of the past because, dammit, it has been a hard time and we deserved it. The economy was booming and if I don’t buy a house now, I will never be able to afford one?!?!? Prices are going up 15-30% a year. Of course, we all know what happened. Many people bought into the hype and “super-sized” their home and FIXED expenses with a BIG mortgage. Banks were eager to lend on this value increasing asset and really weren’t too concerned on whether or not you could pay, because if you can’t they will just sell it for more than you bought it for….I mean, these things are appreciating 15-30% per year afterall. Yeah…we all know how that turned out. This is a very simple and concise example that you cannot violate the simple truths of business and financial management and come out ahead. Ever. It never works and there are always consequences. There is no “easy” way to buy a home and accumulate wealth…sorry. You have to save and live within your means. Today, almost every single one of us knows someone who has been through the terrible process of a forced foreclosure (or maybe even you have gone through a foreclosure yourself) . A lot of us know someone who could pay the mortgage but the house is worth just a fraction of what they paid they are electing to “walk away” and give the keys back to the bank. All of this is bad for the individuals and families, our economy, and for our neighborhoods and communities. A de-stabilized housing market (which we are in now) creates a ripple effect of problems. As homes are abandoned, they often bring about blight to the neighborhood and increased chance of crime. As they decline in value, they drag down adjoining homes often trapping those residents who now can’t sell the property for what is owed so they often, in fact, choose to let the property go into foreclosure. On the surface, this is a terrible spiral of death. Underneath, it only gets worse. As more foreclosures happen, crime upticks and value plummet and then the tax revenue to the city declines. But guess who isn’t good at adjusting spending based on decrease revenues? You guessed it….yep, the government. Instead of really tightening their belts, they end up raising the tax rate to cover the loss of revenue from declined housing values…making living and buying a home in that neighborhood increasingly unattractive. I can go on forever but I assume you can see how the collapse of the housing market is truly the straw that broke the middle classes back in America. So here is the deal. We cannot wait on the government or banks or Fannie Mae or Freddie Mac to fix housing. We have to do it ourselves. If you believe that America will recover and prosper, and you have the means, go out and buy a foreclosure as an investment and rent it out. If you believe that no matter what you do that America will never recover then why the heck are you on this website. Go have a beer! The rest of us will be finding those ragged looking homes and trying to fix them up to (hopefully) stop dragging the housing market down. 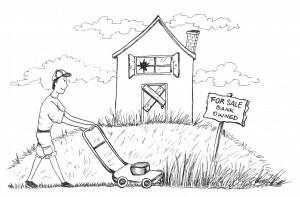 If the bank that owns that foreclosure in your neighborhood is letting the grass get too high….then get your mower and cut it. I don’t care if you think you are “trespassing”….just get it done and get it fixed. Encourage your neighbors to do the same and take back your neighborhood. Try to find good people to come in and buy up the vacant homes…it will not only help you but also your city and community. I will be taking on what I think is the most dangerous type of home…and house that has not been foreclosed on but the owner has just flat out abandoned. To my dismay, this is the house next door to mine. It is a relatively new home. It has a tree limb through the porch and small bushes growing out the eves. The lawn is a mess and the place has certainly seen better days. I will be sure to post a before and after photo for your viewing pleasure. Spring is in the air…time for some foreclosure Spring cleaning. Who’s with me? #1: I Can mow the yard or help maintain a foreclosure in my neighborhood should I notice that it has gotten unsightly.